We love our Sunspace sunroom! We loved our covered deck and wanted to keep the unique ceiling and floor but were worried a sunroom would change it. We toyed with screening it ourselves and knew we wouldn’t do it justice. We talked to Claudia from Butler Home Improvement at a local home show and immediately felt a connection with her. She came to our home and measured and measured and then her project manager measured again! There was ABSOLUTELY no pressure from Claudia or her staff. They didn’t try to upsell us and when we asked about updating the flooring they actually discouraged it. We were given plenty of time to think over the project. The project itself went extremely smooth and we were able to incorporate our existing floor and ceiling. Everything was explained to us in detail and we had everyone’s number if we had questions. We were a bit fearful of building debris because our 10 month old grandson spent a lot of time with us. The site was as clean as possible and the team even worked around our landscaping, minimizing impact. We can’t thank Butler enough for their professionalism and quality install. We love our Sunspace sunroom and look forward to many years of use. Dave and Butler Home Family, thank you again for a terrific job done. Now I am totally thrilled with my home outdoor project. Adding the new posts have made a big difference. Dave, I hope we get the pleasure of crossing paths again in the near future. 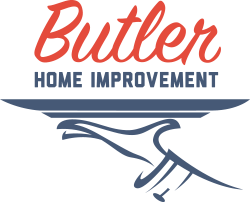 We would like to take this opportunity to thank you for the wonderful work that Butler Home Improvement has done for our family. The installation of our new windows has made a remarkable difference. We have received many compliments from friends, family, neighbors and complete strangers as they walk by. We have seen a significant decrease in our electric and gas bills, due in part to the new windows and the insulation that they provide. Kevin is a wonderful worker and Butler should be proud to have him. As the installer of all of our windows, he always cleans up after himself and we don't have to worry about the job being completed right. Thank you for the wonderful quality of work you have provided for us. My sincere thanks for a beautiful deck. The team was wonderful! My special thanks to Jamie and David. David managed the job like it was done at his own home. I felt like I had a family working for me. I couldn't be more happy and confident. Wishing you all a very happy, healthy and prosperous holiday! Dear Butler Home Improvement, we are very pleased with the siding. Jeff and Steve are to be commended. They worked steady, in a professional manner, paid attention to details and the quality of their craftsmanship. They listened to any concerns and made every effort to address the issues. Your product is good, but the work crew made the difference that sets you apart from the others. I will most certainly recommend Butler Home Improvement to everyone! To Whom it May Concern, please be advised that I’m writing this letter in regards to my recent sunroom completed at my home. First of all, the sunroom is absolutely beautiful! The job was done in a professional manner all the way from the Project Consultant, the work crew, who did an outstanding job from beginning to end. The electrician, Sal, was also very courteous, helpful and did an absolute superb job from start to finish. I must add that I am very, very pleased with the finished project and extremely pleased with the entire work crew and might add Lisa, was also very courteous and always helpful. Thanks again for the wonderful job and it’s been a real pleasure working with everyone. Peggy, just a short note to let you know how I enjoyed working with the crew that did my home improvement. I felt like they treated it like it was their own house. Also, you have a great salesman working for you (Chris). Thanks again! Dealing with Butler Home Improvement made our sunroom dream a reality. We enjoyed the process from the planning phase with our salesperson, Chris, then with our job foreman, Mark, during the building process. The craftsmen on the job daily were courteous and professional, making sure their worksite was safe, tidy, and secure before leaving at the end of the day. Peggy and Mark have been very responsive and timely with the minimal follow-up service calls since the completion of the project over a year ago. We find Butler to be very conscientious and dedicated to being a contractor their clients will recommend to their friends. We are very satisfied with our finished product and plan to enjoy it one season after another. Peggy and Chris, 65 years old and I want you to know that I've never felt more comfortable with a product and the distributor and believe me, I have seen a lot. Kudos to the both of you! I recently used Butler Home Improvement to help me prepare my father's house for sale. I had used another contractor to remove an attached screened in porch and other small jobs. They left the house a mess and much work undone. Butler came in fixed the problems, I am extremely happy with the work that was done. I had mismatched siding on the house that they fixed. They repaired a damaged roof, reattached guttering, power washed the siding and fence, painted and repaired shutters. I would definitely recommend Butler Home Improvement!!!! Thank You For Our Beautiful Deck! Dear Butler Home Improvement, thank you for building our beautiful deck. The redwood color is perfect and I have already received positive comments from friends, neighbors, and family. I'm glad it was built just in time for the 4th of July. Thanks again. Butler weatherproofed an area 16' x 28' under our deck with a Sunspace screen room. They provided a waterproof ceiling and Sunspace walls. All steps from design to constructions was done professionally. The room was built on time and budget. The quality of the workmanship was excellent. We now enjoy a maintenance free room that is perfect for relaxing. We used butler for new windows. All employees were very professional, and performed quality work in a timely manner. Project consultant was very easy to contact and very accomodating to our schedules.